At Studio Booths we specialize in entertainment photoshoots. 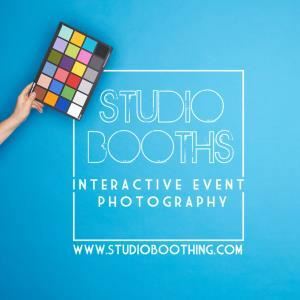 We provide custom designed mobile photoshoots, open air sets, studio lighting & prop rentals for weddings, parties, & corporate events; an innovative approach to the traditional photobooth. Think outside the box & book an interactive entertainment photoshoot for the entire party with our on-site photographers, live streaming, iPad browsing, and custom souvenirs! Everyone loves a photobooth, there’s no question there! What we specialize in is taking that fundamental interactive photobooth experience, that people know and love, and blending it with a professional photoshoot to transform your “photobooth” into entertainment for the whole party. Our open air studios can accommodate upwards of 15 people so it’s not only great for groups, it’s also very entertaining to watch! Being out in the open, showing guests giggling, laughing and having a fun time, amps up the energy and sets the party atmosphere. Our setups are very inviting and we end up providing 3-4 times as many candid images as a traditional “box” style setup, but with beautiful studio quality lighting and a professional coach. Each guest looks and feels amazing as they see their images immediately pop up on the screen, on iPads, and on printed souvenirs. Watching images being created in real time inspires spectating guests to think creatively and “try it themselves”! There isn’t an age group that hasn’t wanted to give it a go and loved it after they did!